Japan’s mission to extract surface samples from an asteroid and return them to Earth appears to be going exceptionally well. The collection phase of the mission happened late last week, when the Hayabusa2 probe made its much-anticipated descent to the surface of the one-kilometre-wide asteroid, which is located about 3.2 billion kilometres from Earth. 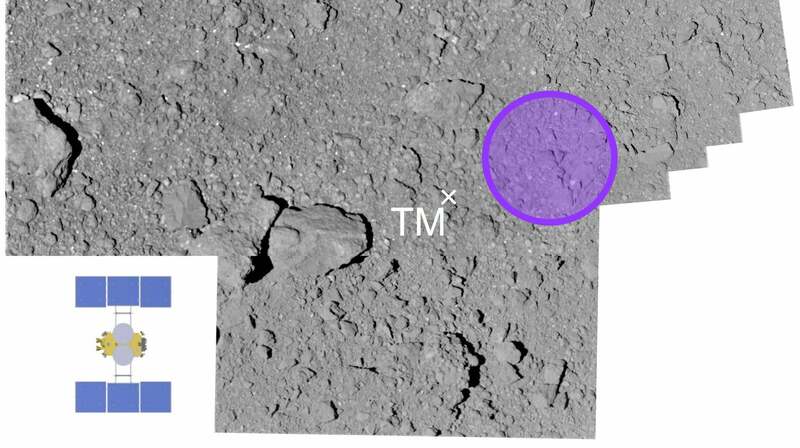 To gather samples, the Hayabusa2 probe used a projector—a kind of gun—to shoot a 5-gram tantalum bullet into the surface of Ryugu at 300 metres per second, or nearly 1,000 feet per second. Debris kicked up by the impact was then collected by the probe’s sampler horn. At least in theory—we won’t truly know if material entered into the horn until the probe returns to Earth in December 2020. A new image released by JAXA shows a black smudge at the sample site. Hayabusa2 took the photo with its Optical Navigation Camera about one minute after the touchdown, and as it was returning to its home position some 20 kilometres (12.4 miles) above the asteroid. The probe snapped the photo when it was about 25 metres (82 feet) from the sample site. The cause and nature of the darkened area aren’t entirely clear. Both theories make sense, and it could be a combination of the two. It’s not clear, however, if the impact itself caused the discoloration, or if the activities of the probe upturned darkened material from below. Or if it’s something else entirely. An annotated image shows the planned touchdown site in purple. 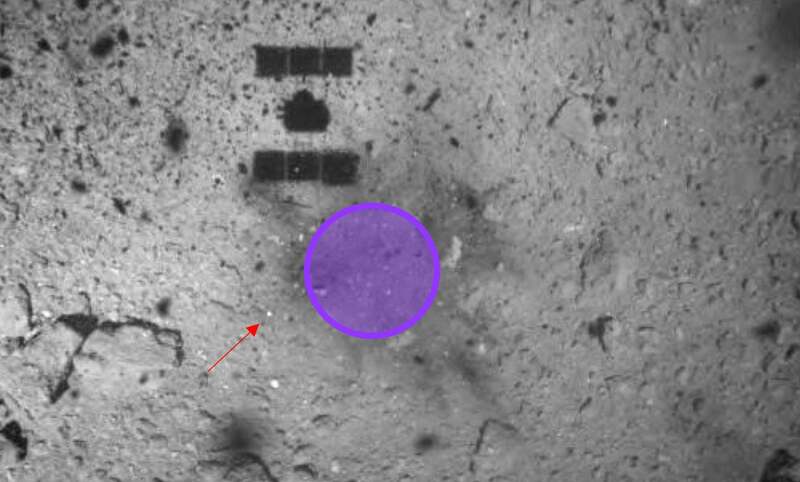 The red arrow indicates a target marker deployed earlier by the probe; the shiny marker provided a reference point for Hayabusa2 as it was making its descent. The JAXA mission planners were hoping to land about 4 to 5 metres (13 to 16 feet) from the marker, the BBC reports. Looking at the 6-metre-wide target area and the dark splotches, it would appear that Hayabusa2 nailed the landing site. JAXA also released an image showing the area prior to touchdown. No discoloration can be seen in the photos, which means the probe’s activities are almost certainly responsible for the new surface feature. In preparatory tests done on Earth by JAXA, the tremendous force of the bullet’s impact could be seen in slow-motion footage. It should thus come as little surprise that the impact on Ryugu, with its minimal gravity, would produce such a dramatic surface feature. Featured image: JAXA, University of Tokyo, Kochi University, Rikkyo University, Nagoya University, Chiba Institute of Technology, Meiji University, University of Aizu, AIST.